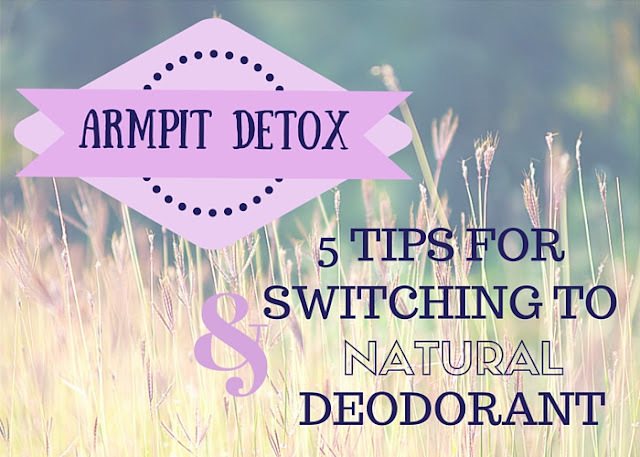 There's an abundance of information circulating about WHY you should switch to natural deodorant, but not a whole lot of guides for easing through the actual transition. And, judging by the number of emails and questions I've gotten on this topic in the nearly five years since I launched this blog, it's obviously an information gap that needs filling! Natural deodorants DO work, but if you're transitioning from conventional deodorants and antiperspirants, there's a very real detox period that you need to traverse to make them work for you. Where deodorants work to kill surface bacteria that causes odor, antiperspirants actually inhibit the body's ability to sweat, usually by means of one of a few different aluminum compounds. Very simply, when aluminum is absorbed into the sweat ducts, it causes them to swell and squeeze closed. Sweat becomes trapped and is unable to escape. Aluminum has been linked to a lot of scary things: breast cancer, Alzheimer's, hormonal imbalances, kidney disease, and liver toxicity - to name just a few. Although several of these disease claims have been disproven more recently, it's still an ingredient I recommend avoiding in your personal care products. Here's my bottom line: Sweating is a natural process. It's one of the main ways the body detoxifies and regulates temperature, so inhibiting sweat also inhibits the body's ability to perform these basic functions. Switching from antiperspirant to deodorant is a process. If you aren't aware of this, it's easy to assume a new deodorant just isn't working, but the reality is, your body needs to both relearn how to sweat normally and process out any aluminum, toxins, and buildup that may have accumulated while you were using antiperspirant. I do not consider armpit rashes a normal part of this detox period and would reconsider the deodorant product(s) you're using if you start experiencing rashes or serious irritation. Map out a 2-3 week period when you can afford to fuss a little more. You may end up a little stinky or you may need to reapply your deodorant multiple times during the day, so pick a time when that won't be a serious issue. You want to avoid flipflopping between antiperspirant and natural deodorant, since that will keep you indefinitely in the detox stage. Your body needs to literally push out the aluminum and other toxins that have built up in the sweat ducts, and the only way it can do that is by sweating. Working up a sweat - be it from exercise, saunas, or hot baths - will help flush these out quicker and shorten the detox period. Staying hydrated is always a good thing, but it's especially vital for any detox. Water helps your lymph system work more effectively and will help your body expel build up and toxins. Plus, if you followed number 2, you'll need to replenish the fluids you lost with all that extra sweating! Just as you exfoliate your face to get rid of dead skin and debris, the same can be helpful for your pits. Dry brushing pre-shower or using a body scrub or loofah in the shower both work to slough off any of the junk that's being expelled. Clay masks are also great for opening up and clearing pores, and a simple mask of clay and water (or apple cider vinegar) applied to the underarms a couple times a week during this transition period can do wonders at keeping you smelling better and on track to beating the pit detox! The long term goal is, obviously, to find a deodorant that will keep you smelling great all day long, but realistically, you'll probably need to reapply during the transition period. Keeping a travel deodorant handy eliminates the stress of smelling midday and not having anything to touch up with. Wipes are another great option for freshening up on the go. Stay tuned for product recommendations + all my deodorant favorites on Monday! Thanks Sabrina! I've been wanting to write this one for a while now :) Definitely feel free to share! My biggest issue has been painful cystic acne with natural deodorant creams. For some reason, I have no issue with natural deodorant sticks (and I've tried/used a LOT over the past two years), but creams cause problems after 3-4 weeks of use. Go figure! This is a great post for newbies.